CLANDESTINE NUCLEAR PROJECTS OF BURMESE JUNTA ALMOST COMPLETED. While the whole world focus their attention on North Korean provocation of hostile Ballistic Missiles program with Medias reveal them in bold line letters, another involvements of North Korean Nuclear Technology are almost completed their projects in military rule Burma with full force of support by hundreds of North Korean Technicians and Technology but no one ever notice their rapid progress. First project among other is located in the area of Maymyo (Pyinoolwin) and groups of villages were removed by force since year 2001. Construction of Nuclear Reactor in that area locally known as Kone-Baw village is almost completed. The most important raw material Uranium, require for Nuclear Project was founded in Lashio area of North-Eastern Shan State thus transportation is very convenience because the project site and Lashio are on the same road famously known in the old day called Burma-China road. It is also has easy access from port City of Rangoon to carry the old second-hand machinery and parts from North Korea. Training of technicians to run that reactor was commenced since year 2001. Groups of Army Engineering graduates were sent to Russia for further study. Sad news for Burmese people are that the Pwe-Kauk water-fall originally known as BE fall in Maymyo, which remained as recreation centre for people almost a century long was now blocked to build Dam to provide require irrigation system for Nuclear Project. Construction of Dam was undertaken by Irrigation Department and works was done for more than 50% of the project. Relocating of villages, cultivated area and even including Buddhist Temples and Monasteries were done by force of military authority and painful to the inhabitants because they all are staying in the area by generations. Impact to environments with demolition of local flora and fauna are not substitutable but permanent. Persecuting of local communities by authority is not just stopped yet. The beautiful landscaping, watershed and catchments area important for local farmers and inhabitants were damaged by explosion of mines for irrigation project. Explosion of mine destroyed not only the natural heritage but also the life-blood of local people. Big poultry farm of international standard with higher technology own by native of the country’s business group was suffering the lost of many fowls dead by explosion every day. Instead of compensating or finding the alternative way to avoid the lost of properties, military authority issue the order to close the poultry farm. That will be a big waste of millions and millions of investment. That poultry farm is intending to educate the latest technology to local farmer for higher yield of poultry but now all are down to the drain. Furthermore, poor local workers employed by farm will face the hardship of unemployment problem in near future. Second project was started in Magwe Division, Min-Bu district, near Nga Phae village adjacent to the famous Scared Foot Print of Lord Buddha Which is call in Burmese “Mann-Shwe-Set-Taw Pagoda”. That project was built and supported by Russian Government with agreement of completion in 5 years term. Project included the building of Dam on the scared and famous Mann creek. Mann creek is famous for crystal clear water that pilgrims of Scared Foot Print Pagoda can lodge on the bank of the creek and enjoy the scene of surrounding mountain ridges with flowing water of which can see through to the bad of the creek decorated with stone pebble naturally. All of those beautiful natural gifts will became fairy tale in next 5 years time. Third project will be building in east of Ya-Mae-Thinn Township. Military authority starts giving the marching order to local inhabitants that those refuse to move or try to delay were encountered with shooting incident by soldiers. Military authority issuing the Civil Act Section (144) in that area means authorizing the soldiers with license to kill. For the local farmers, they are staying in that area by generations and their forefathers converted the raw land into the fertile and cultivated land so for them move away mean commencing of poverty and famine. List of dead and injury by shooting are mounting in the area. All of above three projects shown clearly that requirement for energy and electricity are not eminent in the region of where the Nuclear Reactors were located. Almost all of the Industrial Zone are around in Rangoon area and which are the most needed places for electricity supply but all three Nuclear Reactors are not built nearby so intention of Nuclear projects are very clear that they are not for peaceful purpose. Wasting of people’s money in Junta’s paranoia of protection and safety only for them is something selfish and ridiculous. Junta’s paranoia is obvious that they built the tunnel from their resident to airport in Nay-Pyi-Daw using the so much amount of people’s money only for their escape from people’s justice. Furthermore, how we can trust the secondhand materials and technology of North Korea with their technicians. Nobody can assure the reliability and ability of North Korean as no proof of reputation about them. If we are thinking deeper about the safety of nuclear accident, we are terrified with fears and scare. Russians are not much better as we still can’t forget the Chernobyl accident in 1985 at old Soviet Union. Constructions of the Dams in all around the Burma by Irrigation Department were very irresponsible and non-considerate matters as that caused so many negative effects. Impact on ecological balance was so great and that cause irregularity in weather and environmental damages. Relocating of people and villages because of constructions and flooding of water catchments cause unemployment and lost of fertile land. An extinction of local flora and fauna are not replaceable. But those Irrigation Department engineers involved in constructions projects were rich and became millionaires. They make their fortune by misusing people’s money, stealing and accepting bribes from sub-contractors for keeping the blind eyes on unqualified works etc. They own one after another of big houses in posh area of Rangoon and in every big cities including abroad. They can send their children to get further education in USA and UK. They are the one kind of class in Burma as can only compete with generals in corruption. The person in-charge for all those senseless projects was recently honored by Junta and was promoted to the post of full general. 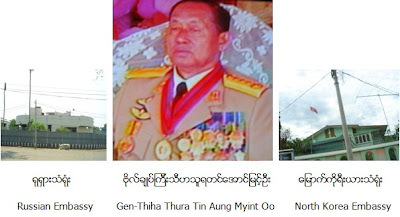 He can be proud of misusing people’s properties and obeying the order of uneducated brainless paranoid Than Shwe so he became three stars general. His name is Thiha Thura Tin Aung Myint Oo.